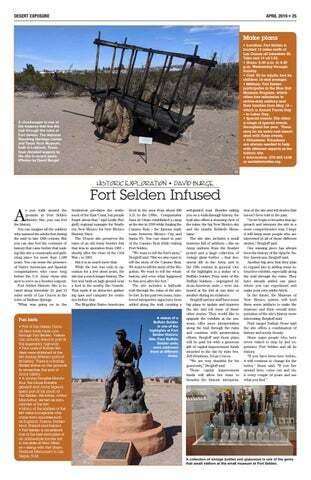 Make plans • Location: Fort Selden is located 13 miles north of Las Cruces off Interstate 25. Take exit 19 off I-25. • Hours: 8:30 a.m. to 4:30 p.m. Wednesday through Sunday. • Cost: $5 for adults; free for children 16 and younger. • Military: Fort Selden participates in the Blue Star Museum Program, which offers free admission to active-duty military and their families from May 18 – which is Armed Forces Day – to Labor Day. • Special events: Site offers a range of special events throughout the year. There may be an extra cost associated with these events. • Volunteers: Volunteers are always needed to help with different aspects at the historic site. • Information: 575-202-1638 or nmhistoricsites.org. Fun facts • Part of the historic Camino Real trade route runs through Fort Selden. Visitors can actually stand in part of this legendary highway. • Four units of Buffalo Soldiers were stationed at the fort during different parts of its history. There is a Buffalo Soldier statue on the grounds to remember this part of Army history. • A young Douglas MacArthur, the future five-star general and Army legend, spent part of his youth at Fort Selden. His father, Arthur MacArthur, served as commander of the fort. • Many of the soldiers at the fort were immigrants who came from countries such as England, France, Switzerland, Poland and Ireland. • Fort Selden is considered one of the best examples of an adobe-style frontier fort in the state of New Mexico – along with Fort Union National Monument in Las Vegas, N.M.
lived in the area from about 400 A.D. to the 1300s. Conquistador Juan de Oñate established a camp at the site in 1598 while forging the Camino Real – the famous trade route between Mexico City and Santa Fe. You can stand in part of the Camino Real while visiting Fort Selden. “We want to tell the fort’s story,” Bergloff said. “But we also want to tell the story of the Camino Real. We want to tell the story of the Mogollon. We want to tell the whole history and even what happened to this area after the fort.” The site includes a half-mile trail through the ruins of the adobe fort. In the past two years, numbered interpretive signs have been added along the trail, creating a A statue of a Buffalo Soldier is one of the highlights at Fort Selden Historic Site. Four Buffalo Soldier units were stationed there at different times. A collection of vintage bottles and glassware is one of the gems that await visitors at the small museum at Fort Selden.